Assessing the academic knowledge of students is central to the goal of improving student achievement and success. High quality assessments have the potential to advance instruction and learning by informing instructional practice, pinpointing student understanding, and ultimately inspiring high-quality teaching and learning. Under ESSA states must align their assessments with state academic standards and such assessments must provide coherent and timely information about student attainment and performance with respect to grade level. In addition, under ESSA states have the option to provide middle schools students with advanced mathematics curriculum and use high school end-of-course assessments for accountability purposes. Finally, states are required to identify languages other than English that are present to a significant extent in the participating student population and, for those languages for which state assessments are not available, make every effort to develop assessments in these languages. AIR has expert staff knowledgeable in the assessment of student achievement and aligning such assessments to content standards, particularly in the content area of mathematics. In addition, AIR has the capacity to support research-based approaches to assessing the academic achievement of ELs, including for example dual language education programs. Finally, AIR offers a full range of student assessment services, collaborating with state, district, and international clients to develop and deploy the most effective and efficient assessment programs through its Student Assessment service area. A study, contracted by the U.S. Department of Education, was conducted by AIR to create framework for evaluating state and local implementation of Title III assessment and accountability provisions. The core product was a technical guide and checklist for state assessment developers and peer reviewers of state English language proficiency (ELP) systems. 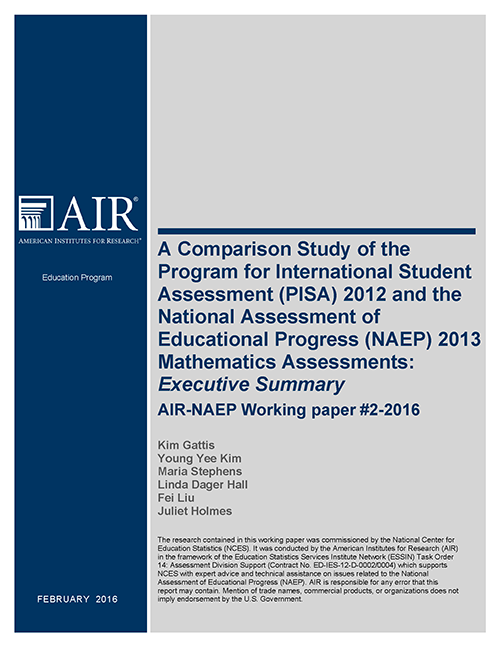 To support the development of this technical guide, the project team conducted a literature review to summarize the theoretical and research literature related to the characteristics of coherent, valid, reliable, and fair assessment systems that are aligned to ELP standards and accessible to all ELL groups. Mastering math and the academic language of math is essential for all students, but especially for English Language Learners (ELLs) who are acquiring content knowledge and English proficiency concurrently. The goal of this three-year study is to enable sixth-grade Spanish-speaking ELLs to acquire the skills and knowledge they need to meet the new Common Core State Standards for math and literacy.